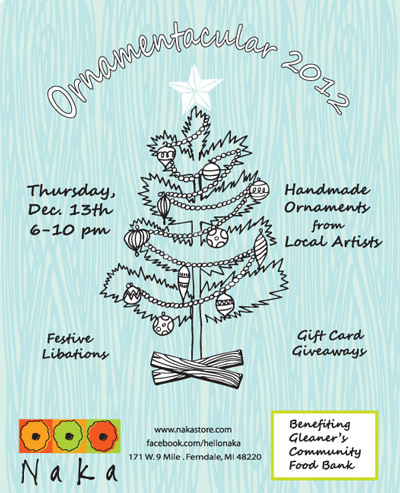 Tonight (Thursday) is Naka’s second annual Ornamentacular – a celebratory evening when they reveal their store’s Christmas tree, full of handmade ornaments from local crafters for sale! This year’s artists are 313 Collective, Bettula, Chuppy Love, Color Me Punk, Lish Dorset, Earthenwood Studios, Glass Action!, Sam Lewis, My Marigold, Phantom Limb, Reware Vintage, Re-Zip It, and Sloe Gin Fizz – and are sure to bring a wide mix of creativity to Naka’s – and your own – tree! Naka will also have treats for it’s customers to drink & eat, in-store specials, and an engraving station for the night from 7-9, by Glass Action!. Ornaments will continue to be available for sale throughout December, and for every ornament sold Naka will donate $1 to Gleaners Community Food Bank. For more information about the Ornamentacular, visit the Facebook event page.